Plans had been laid for a senior school site for the planned Marshalswick housing development soon after the purchase of land for Beaumont Schools. It was to be facing Sandpit Lane. 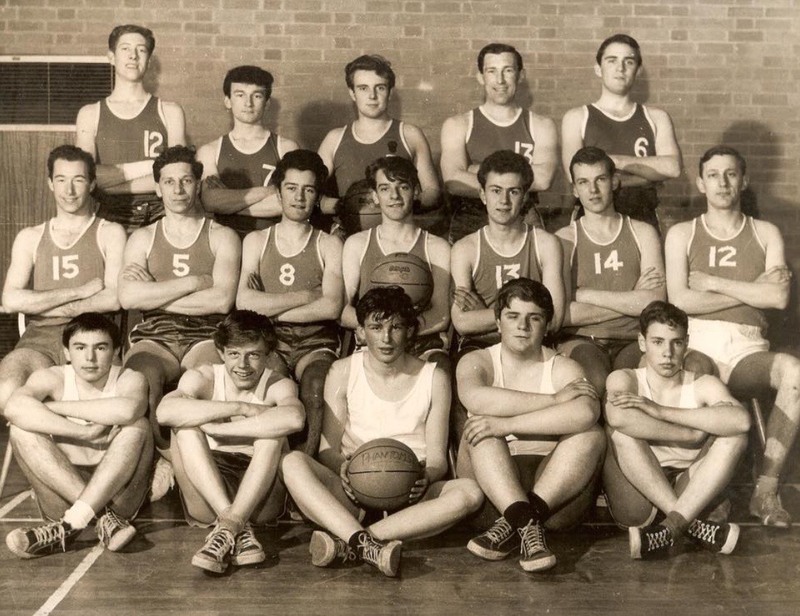 However, the plans for grammar schools got in the way and the boys' grammar school (opened 1938) was allocated Brampton Road, where the playing field was too small. 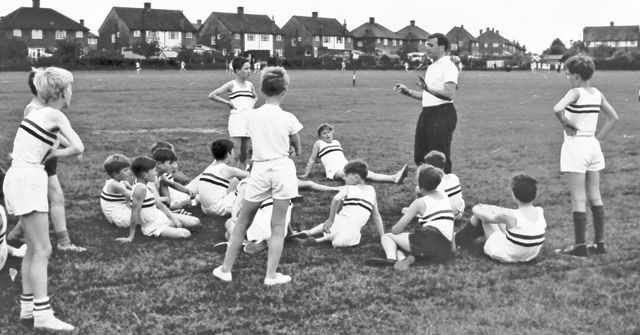 It was therefore also allocated the Sandpit Lane site for some of its playing field needs; and a new search for a school for Marshalswick was concluded in the mid 1950s at The Ridgeway West. It was not ideal as the new Metropolitan Green Belt constrained the buildings close to the road. 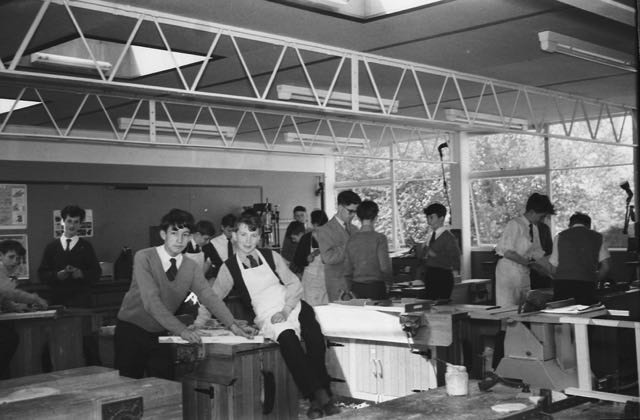 The school opened in September 1959, but as only half of the buildings could be afforded it opened as a boys' school, with the intention of converting it to a mixed school at some point in the future. 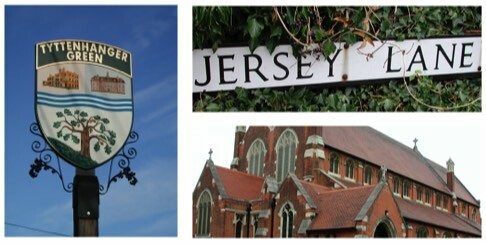 Marshalswick became mixed for the first time in 1972 on a year-by-year amalgamation with Sandfield School (which closed in 1975), and changed its name to Sandringham School in 1981 on amalgamation with Wheathampstead School; both moves retained the premises at The Ridgeway, Marshalswick. Recently rediscovered is this article published in an educational journal in 1968. 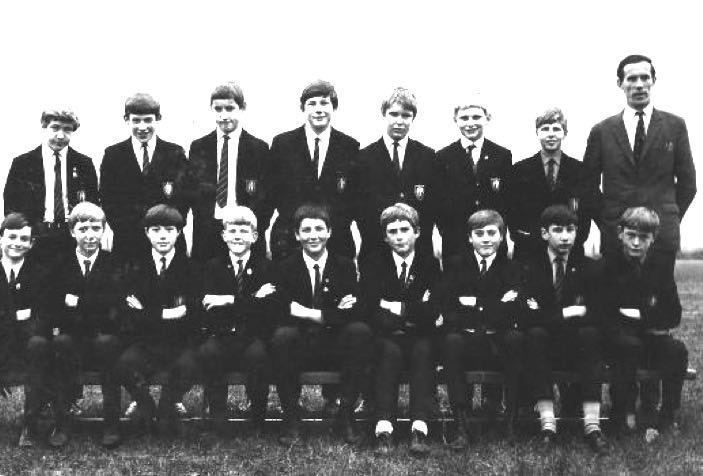 Marshalswick Boys' School had been formed from a nucleus of pupils from Beaumont School in 1959. 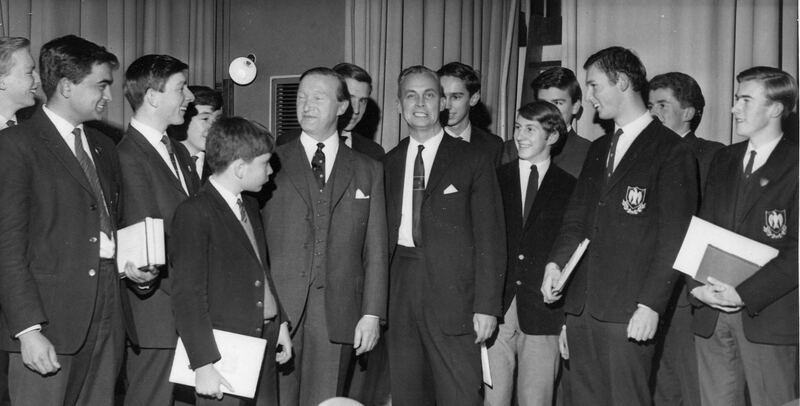 The story of a major early development was told by the school's Director of Music and is reprinted here. Music making at Marshalswick begins in the choir, and the school has a fine choral tradition. 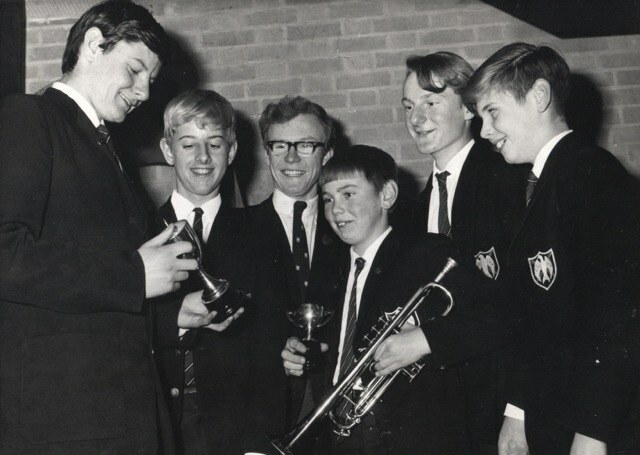 The outstanding record of music activity at Marshalswick stems from the encouragement given by Headmaster F C Mills, who says that the confidence engendered by success on a musical instrument often helps boys with their academic work. 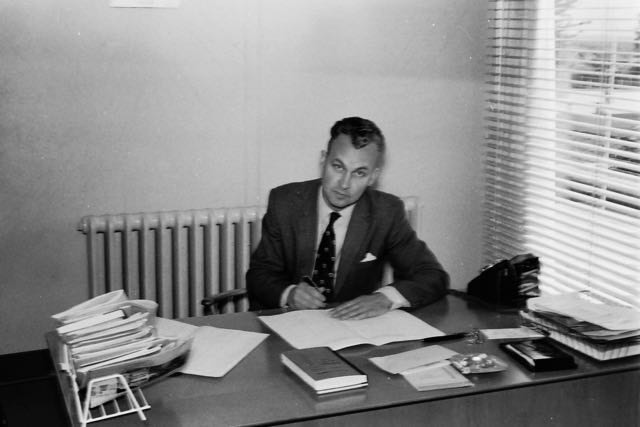 Music Director Ian Hamilton, pictured left, revised his ideas after a spell in the United States [Cleveland, Ohio] where he gained experience of the school band movement. The school has been open for eight years. It began with a choral tradition; two choirs were formed, Large and Small, named because of their numbers: 150 and 30 respectively. 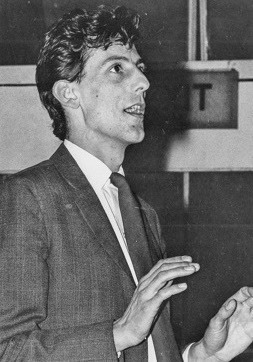 The tradition was carried from the old building [Beaumont School], was based on vocal training carried out in class music periods, and refined in weekly sectional rehearsals. The Small Choir earned its laurels in an unbroken string of successes in the local music festival. “It’s the singing that counts, even if you’re playing an instrument,” is a most valuable thought. 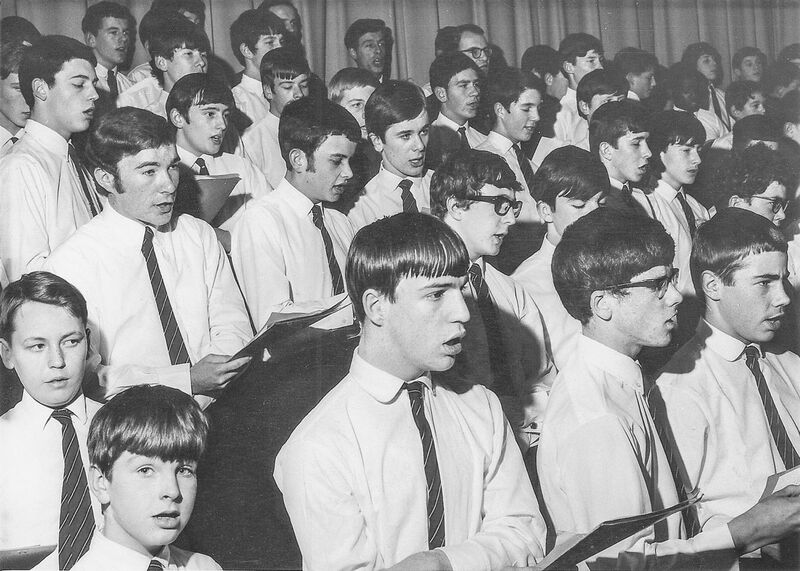 It has meant that choral techniques have been used as the basis for instrumental instruction. In the early days instrumental music was introduced through the recorder, but the present remarkable expansion began with ideas gleaned in America by the music master, Ian L Hamilton. In the past two years the number of boys playing an instrument has increased from 50 to 150, roughly a third of the school. Ultimately the programme is planned to involve a full half of the school. 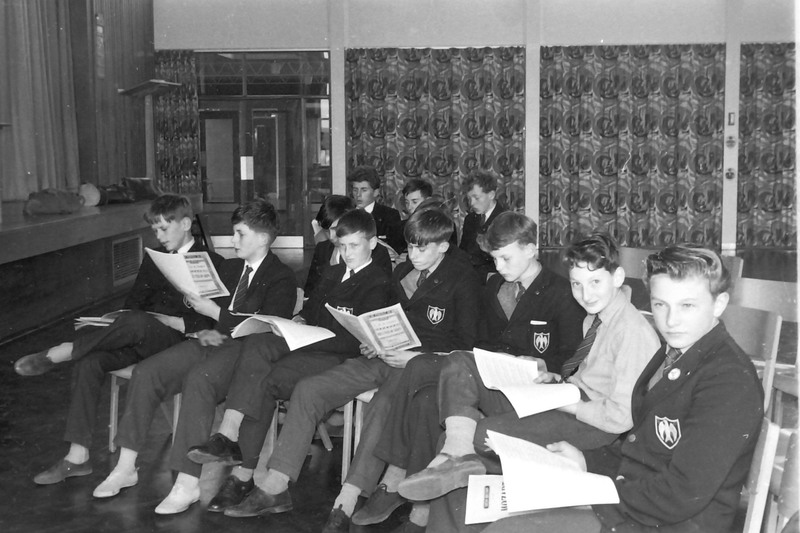 The ingredients for success include the adoption of American Band training methods distributed in this country by Leeds Music; commercial investment by a London firm, Charles Footes, which produced an instrument hire scheme, and the parents of the boys, who responded magnificently to the idea of renting an instrument. 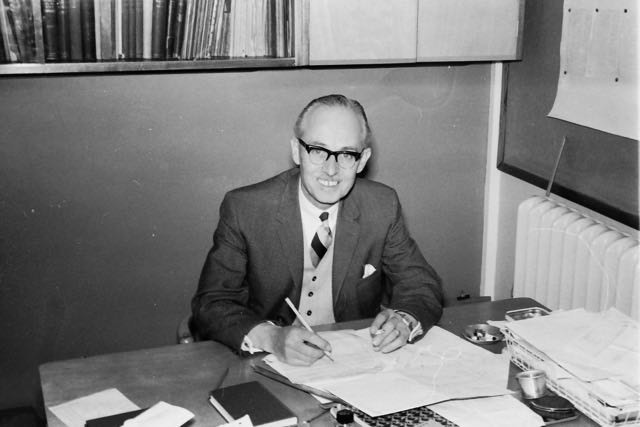 Equally vital to the establishment of the programme was the whole-hearted support given by the Headmaster and his staff, Hertfordshire County Council which paid the salaries of a team of peripatetic teachers, specialists in brass, woodwind and percussion. 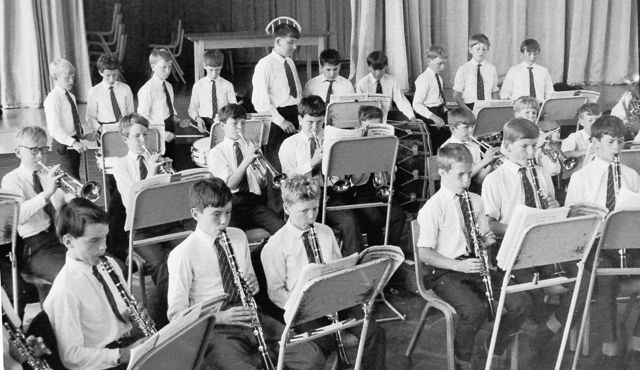 With such large numbers involved it became feasible to put a period of instrument instruction into the school timetable.In their first term at the school boys are introduced to the range of instruments offered (all brass, woodwind, percussion and string bass). After consultation with parents those boys who wish to play an instrument are equipped and launched on the big adventure. Initially, like-instrument groups are established. After two terms parents are advised on the progress made by their sons, the numbers drop slightly, and in the next phase instruments are grouped “like-ability”. The lesson is reinforced by two out-of-school band rehearsals per week where, from the fourth lesson (i.e. fourth week) all sections play together using unison arrangements of melodies and exercises. A full-band, full-blooded version of “The Saints” is the goal for term two! Not bad progress, certainly to a boy’s eyes. Every enducement is offered to motivate home practice and progress is remarkable. American experience suggets a 50% drop-out from the Beginners’ Band, but we have managed to keep ours down to 25%. In the second year we continue to run the five basic groups (flute, clarinet, trumpet, trombone and side drum) but for those who demonstrate the potential we offer the full range of instruments, adding oboe, bassoon, saxaphone, euphonium and french horn. Thus each form in the school develops its own band and the sequence becomes Beginners, Juniors, Intermediate and Concert band. Chair auditions are held in each band and outstanding players may challenge boys in a senior band for a place in that band. Competition is fierce at times! For members of the Concert Band (4 to 6 years playing experience; grades 4 to 8 Guildhall standard) there are wider opportunities. 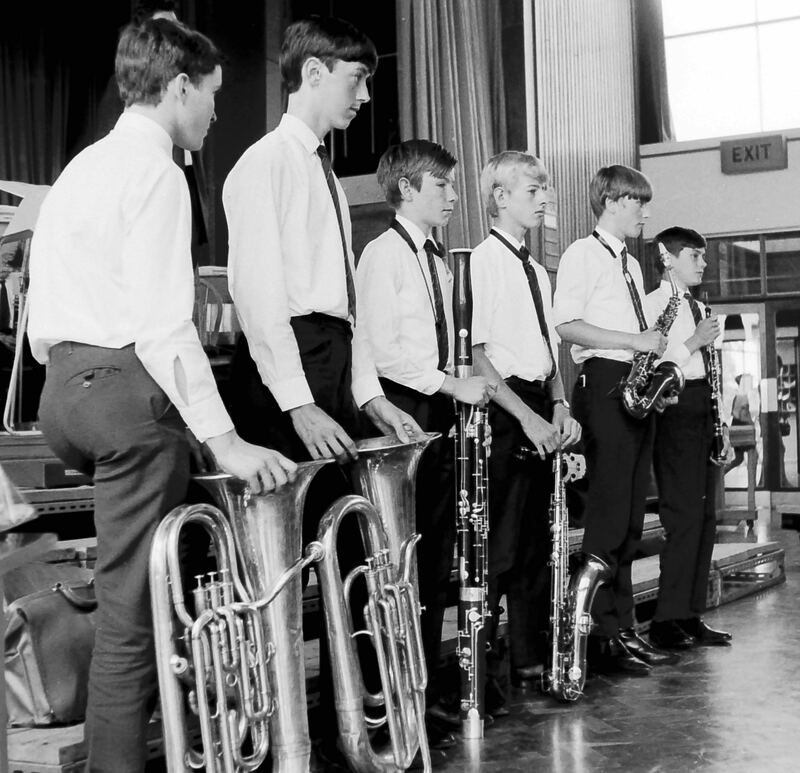 The school Jazz Band (Trad men all!) is one of eight instrumental ensembles which tackle almost anything: Gabrielli Brass, Mozart Divertimentii, Beethoven Wind Quintet, and the wet-inked manuscripts of our composer-teacher, Geoffrey Burgon. Some satiable appetites belong to the local youth orchestra, some spend their holidays on courses organised by the County Council. A few aspire to, but have yet to achieve, membership of “The National”. 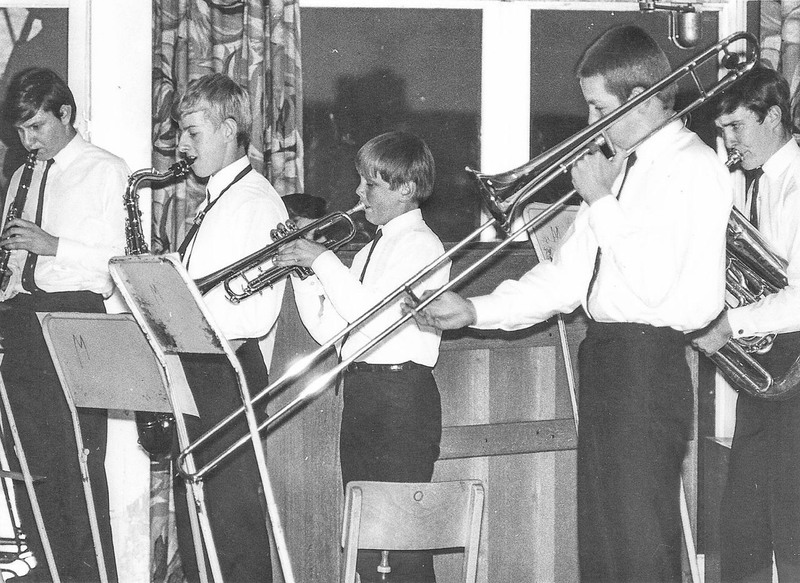 More expensive instruments are provided in the first place by the school; financed by the County Council, the school, fund-raising concerts, and this year, boon of boons, the total monies raised by the Parent Teacher Organisation. From all sources the school now operates £3,500 worth of instruments. All we really lack is a bass clarinet. Any offers? 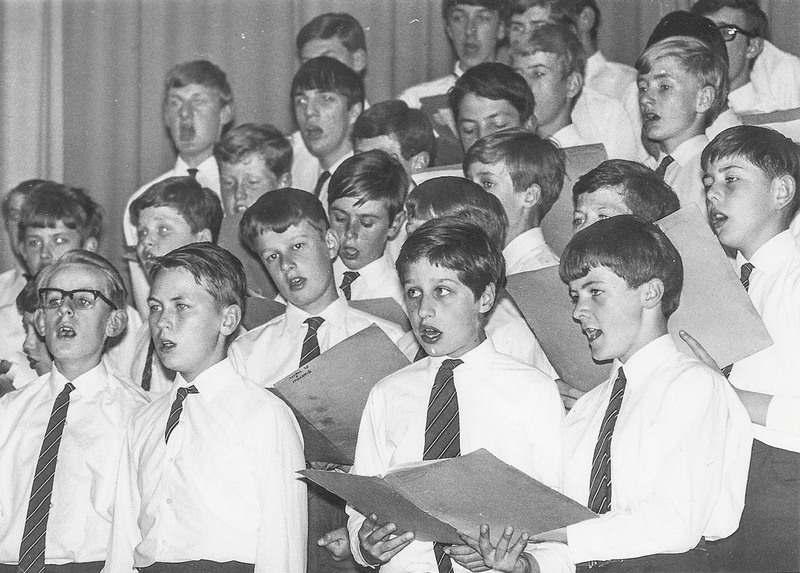 The mettle of band and choir is tested from time to time in festival competitions; one non-placement, two seconds and eight first places (all with honours) is the score to date. Eight public performances alone by the band this year have stimulated an almost embarrassing flood of requests to play “away”. Music in the Secondary Modern School? It swings like a metronome swings! 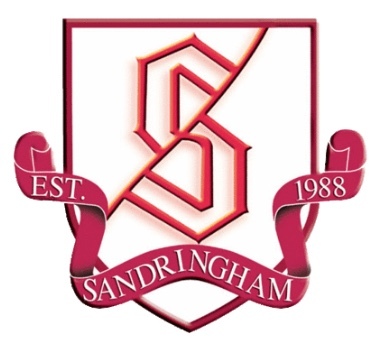 Note: Marshalswick Boys’ School opened in 1959, became a mixed school in 1973, and changed its name to Sandringham School in 1981. 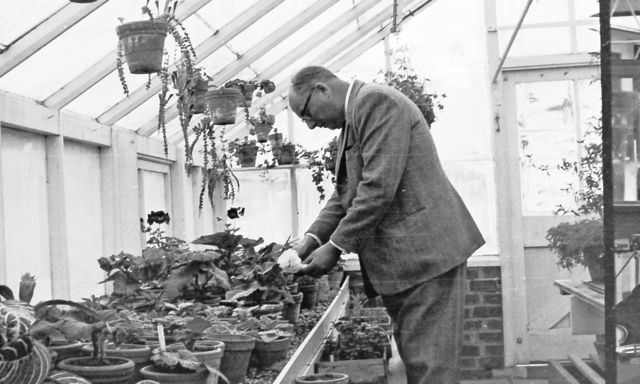 Featured are Mr Bilk tending plants in the school greenhouse; Mr Ronald Kitching, Deputy Head; Mr Ian Hamilton with a large class; Head Teacher Mr Frank Mills. 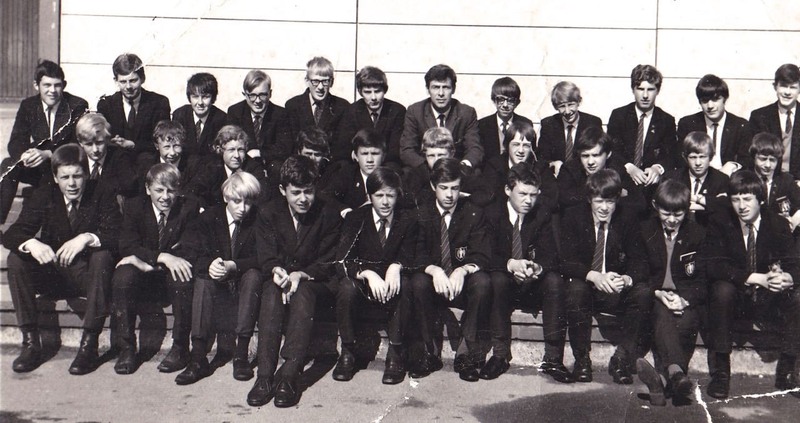 This group of Marshalswick School pupils had entered for the St Albans Music Festival in 1967. 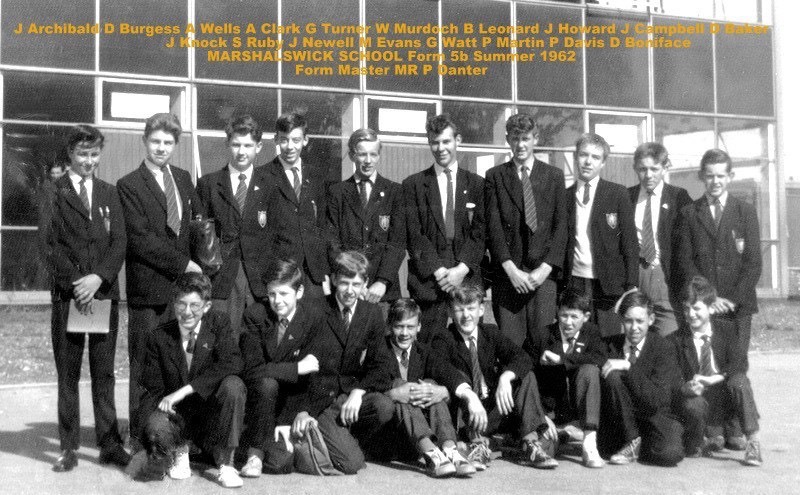 Evidence from the photo suggests at least two of this group (or perhaps all of them) won in their particular categories. Lunchtime rehearsal in the music room. 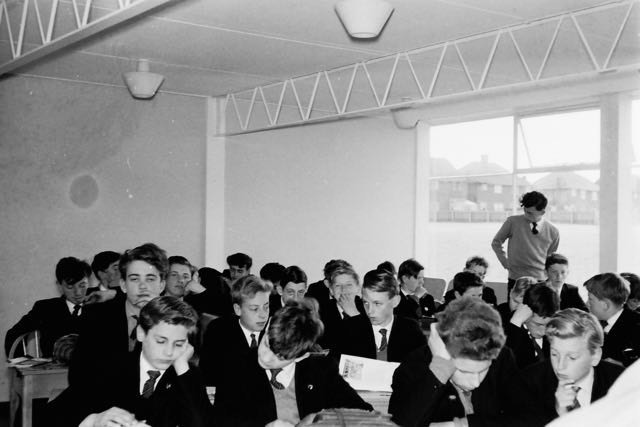 A class in 1961 with their teacher, Miss Wykes. A school rule at the time forbad the wearing of outdoor shoes inside the buildings. This was to protect the floor surfaces of the brand-new school. You can see everyone is wearing plimsolls outside (no rule about that). 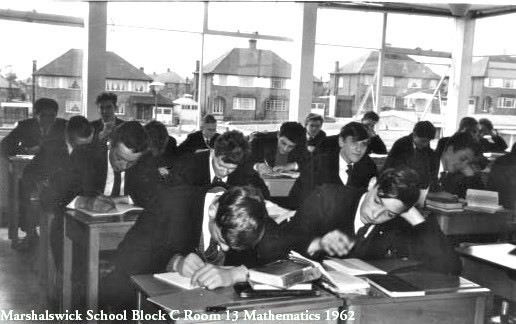 I bet the teachers weren't required to conform. Did anyone recall a teacher in plimsolls, apart from the PE staff? A section of the Concert Band rehearsing for its next performance. 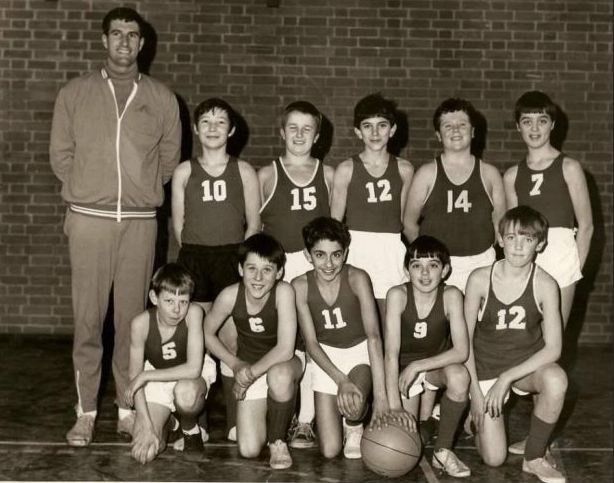 The teacher with this group is thought to be Mr Carvell. Thoughtful design – keep eyes averted from day-to-day life along The Ridgeway. 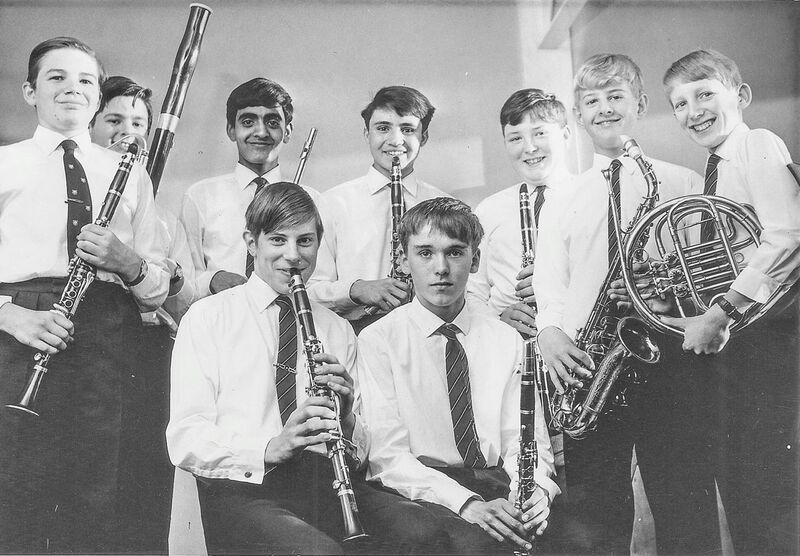 A section of brass and woodwind, but no-one has yet been recognised. Taking centre stage is Head Teacher Frank Mills. Who were the prize-winners though? In that case these players are surely in the line-up. 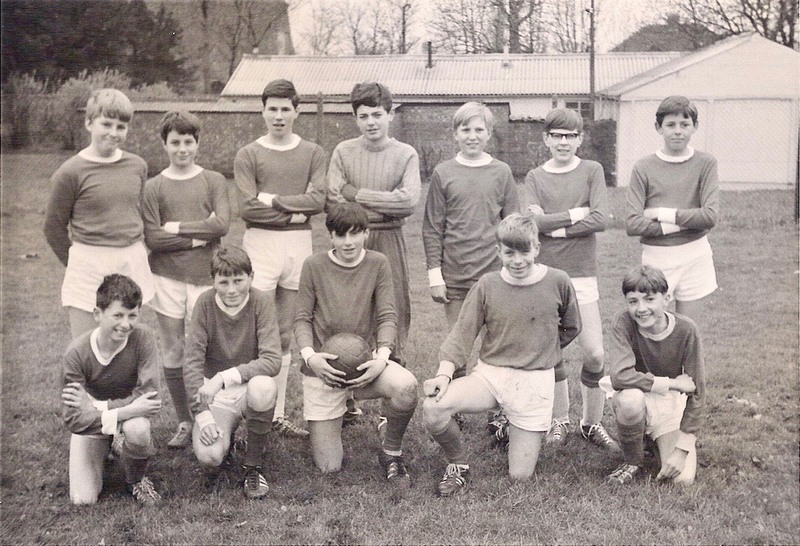 The Cup match was held at Elm Court, Potters Bar. Marshalswick beat Barton PB 5-4. 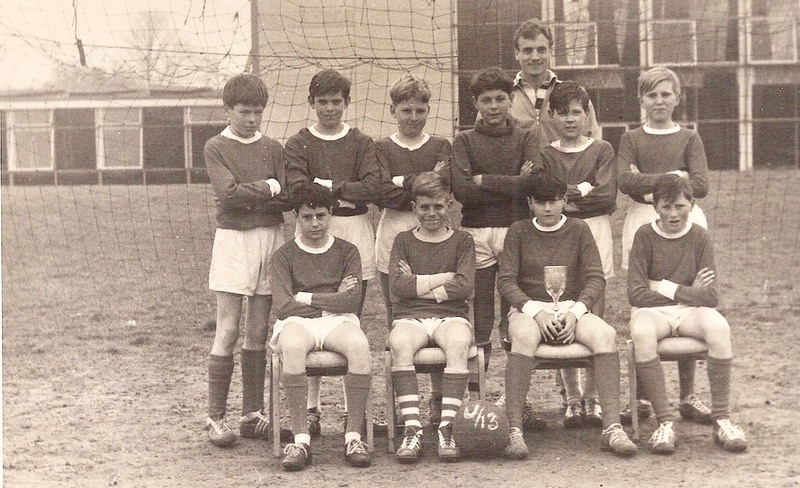 BACK L-R: David McKinnon, Jeremy Hart, Alan Archibald, Neil Davies, Ron Giles, David Stanley, David Hofton. FRONT L-R: Derrick Orchard, Chris Yellop, John Bailey, Stuart Gary, Kimball Keerie. The team back at school with the trophy. Teacher unknown and slight change of line-up. 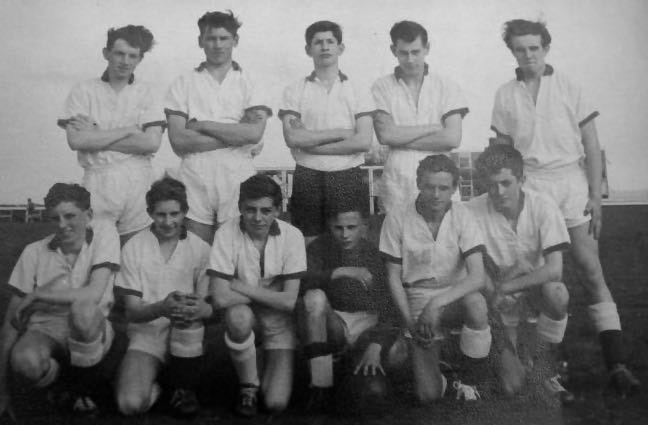 BACK L-R: Gareth Davies, David Hofton, David McKinnon, Neil Davies, David Stanley, Ron Giles. 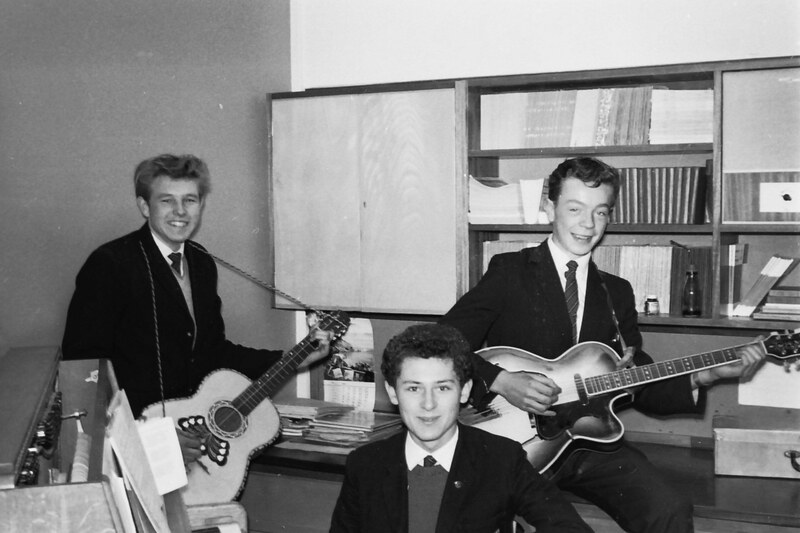 FRONT L-R: Jeremy Hart, Stuart Gary, John Bailey, Chris Yellop. 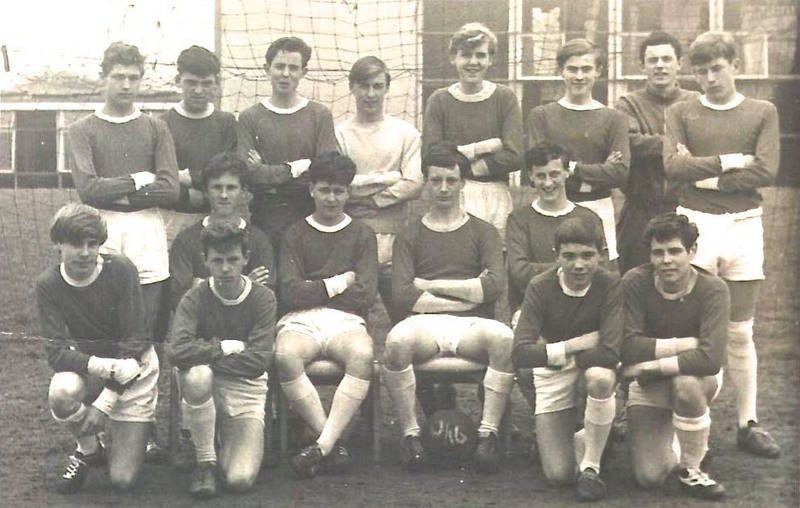 Allen Nicklin is in this show of team strength (back row, 4th from left), but who else is here? 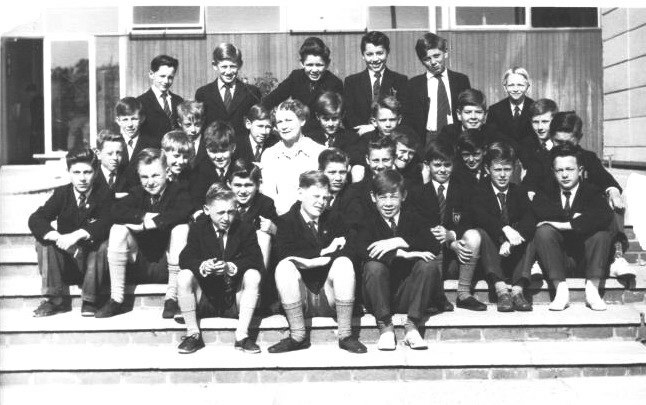 Bill Kerridge (teacher) is in the same row (7th from left). 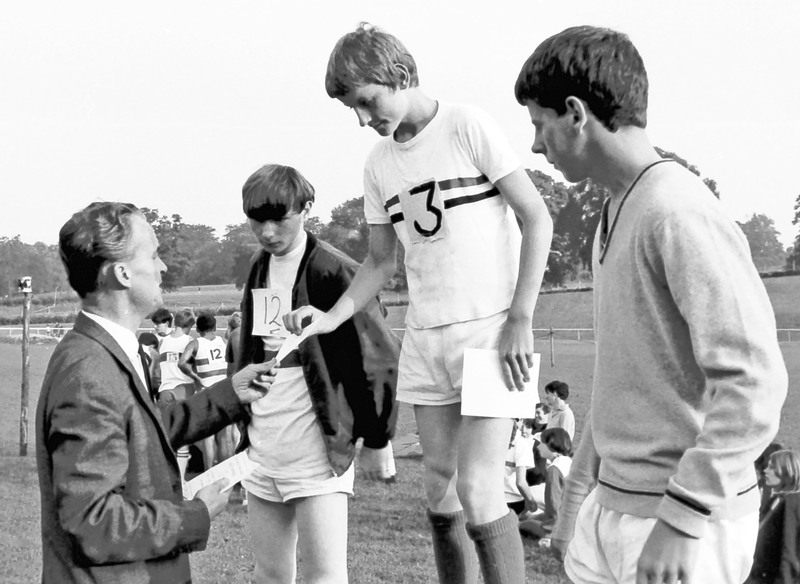 Richard Barnfather receiving a First certificate from his own head teacher, Frank Mills, for either javelin or discus. Second and third place competitors were from other schools. The venue was Westminster Lodge. Nothing is yet recalled about The Phantoms or its players. 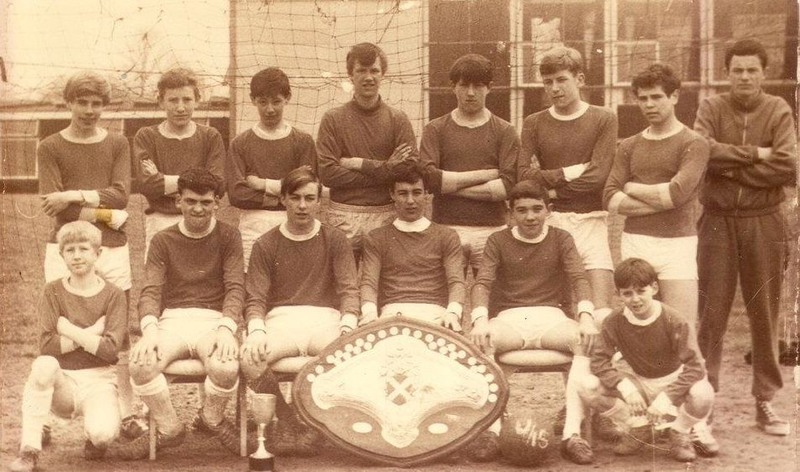 Was it a Marshalswick Old Boys' team, or one from Marshalswick Youth Club?